Amy Edgett / Sierra Sun Looking west from the bridge in Truckee, two hardy souls move quickly to save a swing set from the rampaging river. A cold front came quickly into the region Sunday morning, turning rain into snow and all-but eliminating flood dangers in Truckee and the Truckee Meadows. TRUCKEE, Calif. – As the Truckee River water level rose this weekend amid heavy periods of rainfall, Kirk Heiser was busy preparing for possible flooding. Heiser, who lives on River Road about 100 feet from the river, said hours and days were spent moving everything from furniture to books on the first floor of his house upstairs, making self-serve sandbags with the help of four other men and placing them outside, and shutting off the house’s electricity and propane. “(We were) getting ready for the worst,” he said Sunday morning, at which point he and his family had already left the house. After area residents, towns and counties prepared for flooding this weekend as forecasts called for multiple inches of rainfall in the Tahoe Basin and west of Highway 89, the National Weather Service flood warning issued for the area was lifted Sunday afternoon. A winter storm warning replaced it after a cold front swept through, bringing snow sooner than expected and all-but eliminating flood dangers for Truckee and in the Truckee Meadows, where riverfront neighborhoods in Reno and Sparks were also on alert. “It was certainly a positive turn of events for us getting snow earlier than the weather service had forecast,” said Alex Terrazas, Truckee assistant town manager. 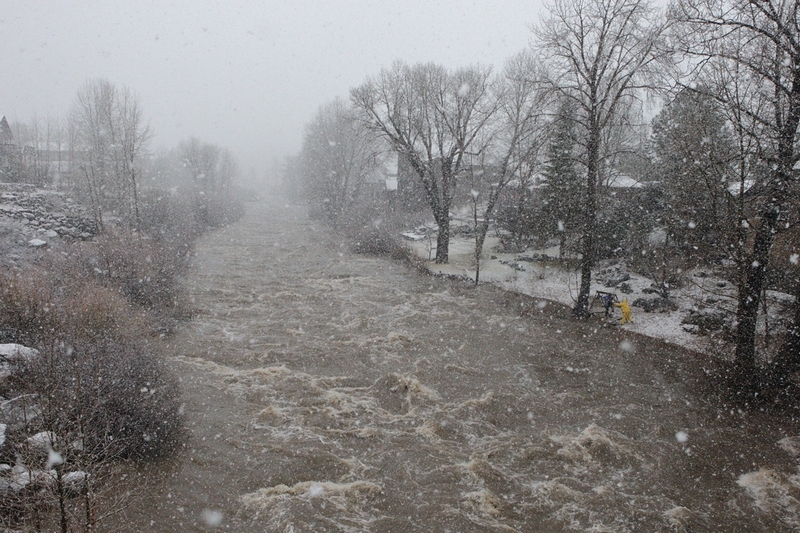 If rain had continued as forecast, the National Oceanographic and Atmospheric Administration was predicting the Truckee River in Truckee to reach 8 feet by 3 p.m. Sunday. The flood stage for that portion of the river is 4.5 feet, Terrazas said. Instead, the river crested at 4.12 feet, said Rui Cunha, assistant director of emergency services for Placer County, with no flooding in Truckee or the Truckee Meadows. In the Sierra foothills, however, multiple intersections and business parking lots in the Grass Valley flooded, but “quickly receded,” said Victor Ferrera, program manager for Nevada County Office of Emergency Services. Communities in eastern Placer County had “little to no flooding,” while the western portion of the county experienced the “greatest flooding,” causing two apartment complexes in Roseville to be evacuated, Cunha said. Siobhan Smart, who lives on Trout Creek Road, was among the residents who labored over the weekend to prepare her house for potential flooding, in light of past floods that have struck the Truckee area. On Jan. 1, 1997, after building up a larger-than-normal snowpack, a warm rain caused creeks, streams and the Truckee River to overflow their banks, causing major flooding in Truckee and down the hill into the Reno area. Further, the last time Truckee and communities within the Truckee Meadows saw significant flooding was late December 2005. “I’m certainly nervous because I don’t want to flood, and they say the best part of the storm is coming, so we’re just trying to plan for that so I am ready,” she said Sunday morning before the rain turned to snow. In an effort to prepare their house, Smart said she and her husband closed their business – Wagon Train Coffee Shop – two hours early on Saturday, which saw about a 50 percent decrease in business on Saturday and Sunday because of the weather warning. As Sunday’s storm neared, officials asked residents in certain areas, particularly those with riverfront homes along Highway 89 and on Foxmead Lane and Riverside Drive near downtown, to take extra precaution. The town of Truckee took several precautions by having additional public works staff on duty Saturday and Sunday checking town drains; contractors on standby to remove debris if it were to clog streams and other bodies of water; opening two sandbag stations; and helping open an American Red Cross evacuation center in the Tahoe Truckee Unified School District’s administration building, Lashbrook said. The evacuation center opened at 6 a.m. Sunday and was prepared to stay open into Monday if needed due to flooding, but closed at 1 p.m. due to the change in weather, Terrazas said. A total of four people used the service, none of whom did so due to flooding, he said. Kyle Yanushka, of Colorado, and three others were backpacking in the area when the storm hit, ultimately seeking refuge at the center. Truckee began coordinating preparation efforts with the emergency services departments of Placer and Nevada counties on Thursday, Terrazas said. Both counties took similar measures as did Truckee, including having multiple community sandbag locations throughout Truckee and North Tahoe. According to NWS, there is a 100 percent chance of rain Wednesday, and then a dry period with mild temperatures is expected to follow. “Now if it would just turn into snow, because we don’t need rain skiing – we need snow skiing,” Smart said. Tahoe ski resorts on Monday reported seeing as much as 2 to 4 feet of snow from this past series of storms, in what officials hope helps lay the foundation for a strong base layer for the 2012-13 ski season. According to reports, Mt. Rose-Ski Tahoe welcomed 45 inches of new snow and has received a total of 100 inches of snowfall to date. On Donner Summit, Sugar Bowl Ski Resort reported storm totals of 44 inches, while Squaw Valley’s upper mountain at 8,200 feet got 42 inches of snow. – Sun Managing Editor Kevin MacMillan contributed to this report.